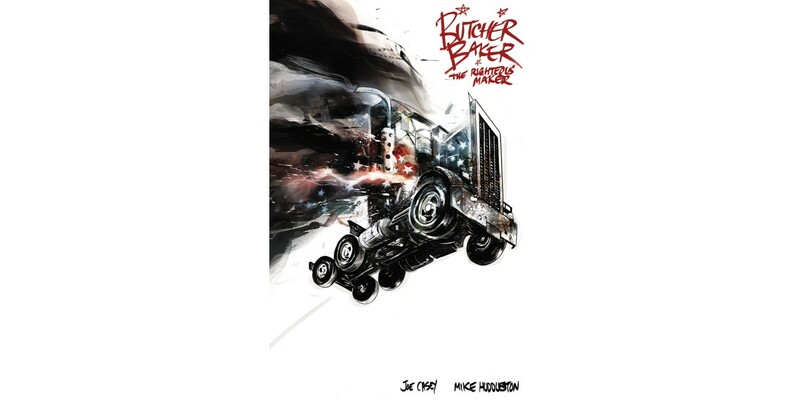 Joe Casey and Mike Huddleston’s BUTCHER BAKER, THE RIGHTEOUS MAKER is back with a new, trade paperback edition available this November. The paperback will collect the complete series, issues #1-8, plus feature bonus material. Butcher Baker was the preeminent all-American superhero. Now he’s…getting laid. A lot. But one last mission could signal his return to glory, and now he’s back on the blacktop! BUTCHER BAKER, THE RIGHTEOUS MAKER is a balls-out, surreal, super-epic that fans won’t want to miss. BUTCHER BAKER, THE RIGHTEOUS MAKER (ISBN: 978-1-5343-0333-1, Diamond Code MAR178439) will hit stores on Wednesday, November 15th. The final order cutoff deadline for retailers is Monday, October 9th. It will be available in bookstores on Tuesday, November 21st and can be pre-ordered on Amazon, Barnes & Noble, Indiebound, and Indigo. Man of Action Entertainment are Joe Casey, Joe Kelly, Duncan Rouleau and Steven T. Seagle, the writers' collective behind comic's largest franchise characters as well as original characters published by their Man of Action imprint at Image Comics. Their creations include Ben 10, the $4.5 billion boys' action franchise for which they're executive producing the new iteration, and Generator Rex, both for Cartoon Network. Dentsu handpicked them to create, write and executive produce the all-new Mega Man series coming to Cartoon Network next year and they also created the upcoming Zak Storm series for Zag. They also launched Disney XD's Marvel's Ultimate Spider-Man and Marvel's Avengers Assemble as EXP/writers. Man of Action created the characters and team featured in Big Hero 6, Disney/Marvel's Academy Award®-winning feature. In addition to creating successful video games, toy lines and comic books, Man of Action are the creator/producer/writers of current and upcoming feature films and live-action TV series based on their original comic books and graphic novels including I Kill Giants, Officer Downe, Kafka, The Crusades and The Great Unknown.